Please note that this page was written in 2007 and may be outdated now. However, we have left it on our website as it provides some historical context to SEN.
Mary Warnock (now Baroness Warnock) is one of the leading, but now controversial, figures to have been involved in the SEN process and debate. The SEN system that we now have together with the individual legal rights that children with SEN and their parents now have are still a fairly recent development. Lady Warnock, aged 88, a former head teacher, academic and leader of several high-profile inquiries, produced a report which laid the foundations for the introduction of Statements of Special Educational Need in England and Wales in the early 1980s. The 'statementing' process can be viewed as one of the most significant changes in legislation. The Education Act 1944 originally established that children's education should be based on their age, aptitude and ability. Eleven categories of 'handicap' were described which included for example, 'educationally subnormal' and 'delicate' as well as blind. At that time, the general philosophy was that the child should fit the school rather than the school fit the child. 1974 saw the establishment of the Warnock Committee, leading to the publication of the Warnock Report 1978, which was named after Mary Warnock, the chair of the inquiry whose remit was to look at the needs of children with SEN. The Warnock Committee's conclusions were that 20% of children in the school population could have SEN but 2% might need support over and above what a mainstream school could provide for. The Warnock Report recommended that there should be specialist provision for children with SEN which could protect the 2% and ensure that they received appropriate provision. The Warnock Report gave rise to the Education Act 1981 which attempted to address the situation. The Act introduced the requirement that LEAs identify and assess pupils who may require the LEA to decide on suitable provision for them. The 1981 Act was eventually surpassed by the Education Act 1993 (which was subsequently consolidated into the Education Act 1996) which required the Secretary of State to issue a Code of Practice on SEN giving practical guidance to LEAs and the governing bodies of all maintained schools about their responsibilities for all children with SEN. Those responsibilities are now set out in Part IV of the Education Act 1996. After extensive consultation with schools, LEAs, the health services, social services and voluntary agencies, the Code of Practice was approved by Parliament as 'The Code of Practice on the Identification and Assessment of Special Educational Needs', which came into effect on September 1st 1994. From that date, schools, LEAs and all those who are involved with children who have SEN, including the health service and social services, have had to adhere to the Code. The 1981 Act also allowed for parents to appeal against decisions made about their child’s SEN in the first instance to the LEA and thereafter to the Secretary of State. However, as this gave rise to problems, the 1993 Act (now 1996 Act) established a national SEN Tribunal which has now become the Special Educational Needs & Disability Tribunal (SENDIST). The 1996 Act was then amended by the Special Educational Needs & Disability Act (SENDA) 2001 which reinforced the Government’s commitment to the inclusion of children with SEN in mainstream schools as well as increasing the rights of parents who wished to Appeal to the SENDIST against LEA decisions to place them in Special Schools. 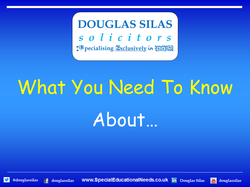 A revised Code of Practice on SEN also came into force in January 2002 and incorporated amendments from the SENDA together with new SEN Regulations which made Inclusion more of a legal requirement. After the implementation of SENDA, the law was amended (by insertion of a new section 316/316A into the Education Act 1996). This change has now required LEAs to place children with SEN in Mainstream Schools not only where it will be compatible with efficient education and the efficient use of resources but to say that they must be educated in a mainstream school unless it is incompatible with efficient education and the wishes of the parent. In mid-2005, Baroness Mary Warnock, published a pamphlet calling for a rethink on special needs and about inclusion and statementing. She has appeared to do an about-turn and has stated that the way in which schools care for children with special needs is a disastrous waste of money and must be overhauled. In an interview with the TES in September 2003 she called the introduction of statements of SEN, which she has claimed the inquiry committee invented, disastrous. "It is the greatest obstacle to good provision," she has said. "There are far more children statemented than we ever envisaged. It has ceased to be about what the child needs and has just become a battle for resources." Baroness Warnock has also said that statements should be abandoned as well as further moves towards inclusion. Instead there should be a broad look at how pupils' social and educational needs could be met. Her comments have followed critical reports in 2002 by Ofsted and the Audit Commission, which have said that the statementing system is bureaucratic and wastes money needed to support vulnerable children. SEN should only be catered for in mainstream schools when it can be supported from within a school’s own resources. The Government has recognised the need to deploy the expertise of teachers from special schools to support and train teachers in mainstream schools but the whole idea of inclusion should be rethought. The present system of statements must be re-examined and put to a different use if it cannot be abolished. Too often children with special needs (with or without statements) in mainstream schools have been taught almost entirely by teaching assistants who are not fully qualified, and therefore they have not benefited from the best teaching;. Mathematically gifted children also have special needs. Inclusion in practice often means that children are physically included but emotionally excluded. A new kind of specialist school would be able to cater properly not only for children with specific disabilities which prevented them from being taught in a large school but also for children with needs that arise from social disadvantage. There has been a great deal of debate about and criticism of Baroness Warnock's comments recently and as part of the recent Parliamentary Inquiry into SEN, which she seems to have provoked. "Mary Warnock’s 2005 attack on statements needs to be commented on because she is accorded the status of special educational needs guru by politicians and the media, and this risks her recent contribution to the debate being accorded a significance which it does not merit. Despite the respect still generally accorded to the original ‘Warnock Report’, on the evidence of her 2005 pamphlet Mary Warnock would seem, now, to know little of how the special educational needs system operates e.g. the pamphlet asserts that 20% of children have Statements of Special Educational Needs, when actual figure is between 2% to 3%. The context of the error makes it clear that it is the author’s, not the typesetter’s: “… our original guess of how many children would receive statements was wildly off the mark. We thought the figure would be around 2%. The actual figure was around 20%”. the pamphlet asserts that parents are dissatisfied with the Special Educational Needs Tribunal and offers as an explanation “Local Authority officials who could hardly be regarded as disinterested, chaired the tribunals (Special Educational Needs Tribunals).” From the evidence of IPSEA casework, this is wrong. In the main, parents are satisfied with the operation of the Tribunal. The whole purpose was for it to be independent, and, in fact, Chairs are qualified solicitors (not LEA officials), and are appointed by the Lord Chancellor. the pamphlet asserts “every school now (has) to appoint someone as a Special Educational Needs Coordinator (or SENCO), whose responsibility (is) to ensure that all the procedures of assessment and statementing (are) properly followed.” This is wrong. Statutory assessment and the drawing up of Statements is the responsibility of the LEA, not of school staff or SENCOs. What the 1978 Warnock Report proposed was a new use for an already existing form (Form SE4), that being to trigger the ‘recording’ of children as in need of special education provision. The Report neither recommend nor described by another name a document with the legal function of the Statement i.e. a contract which would make it mandatory on an LEA to arrange the provision specified in it. The Report referred to parents being able to use their general right to make representations to the Secretary of State if unhappy about an aspect of their child’s education, but this is a very different (and a much weaker) right than the right to seek Judicial Review if your child is not getting the provision specified in his or her statement. (iv) This vital protection is all the more necessary if increased inclusion of children with sen in mainstream schools is going to succeed. " Whether you agree or disagree with Baroness Warnock's recently aired views, there is no doubt that she has raised the temperature on the current debate on SEN! However, the plain fact remains that there are many children with SEN experiencing difficulties obtaining the correct special educational provision or school placement that they require and that there will continue to be disputes between parents and LEAs about this in the SENDIST or High Court for the foreseeable future.